Amanita muscaria or the Fly Agaric is not a well-known mushroom based on its scientific name or common name. Yet, the picture on the left, of this mushroom, will probably be familiar to the reader. In recent time, it is the mushroom that has been adopted as the “prototype” mushroom in western cultures. Its image can be seen in Christmas and greeting cards, children's stories, science fiction and fantasy illustrations, and in mushroom models. There has even been a great deal made of its connections with Christmas, but probably too much has been made of this connection and different interpretations of this theory is available. However, it is more than just a “pretty mushroom”. It is a species that is thought to have had tremendous impact on some of today’s cultures for at least four thousand years and has been thought by some to be at the root of the origin of some of today’s religions. In 1968, Gordon Wasson put forth the concept that this mushroom was the “plant” that was referred to as Soma, in his now much cited “Soma, Divine Mushroom of Immortality”. Wasson believed Soma was the mushroom that was utilized in religious ceremonies, over 4000 years ago, before the beginning of our Christian era, by the people who called themselves “Aryans”. Wasson also believed the hallucinogenic properties of the A. muscaria to be the cause of the “ecstasy” described in the Rig Veda, the holy book of the Hindu. In order to appreciate the story behind the legend of Soma, and the reasoning that Wasson used in selecting it as the Soma of the Rig Veda, I will first describe the mushroom and its development. When young, the mushroom is entirely enclosed by a white universal veil and appears to be a large “white egg”. This stage is very “unmushroomy” in its appearance. However, this stage is one of the defining characteristics of the genus Amanita. This shape is retained until the young mushroom, inside the “egg” begins to grow by expanding its cap and to elongate its stalk. and viscous when moist. Although the characteristic white warts are usually present, they may be washed away after a heavy rain. The gills are white and are “free” from the stalk. The stalk is white, cylindrical and is easily separated from the cap, with a bulbous base and a volva that is typically fragmented into warts arranged in a concentric circle. When fresh, the mushroom’s flesh is white, and its taste and odor are indistinct. After drying the flesh darkens, becoming dark cream to pale brown, with an acrid, nauseating taste. Amanita muscaria is typically a temperate species, but may occur in warmer latitudes, usually in the mountain areas. It is broadly distributed, and can be found throughout Europe, North and Central America, North Africa, Asia and Australia. It is frequently associated with Pine and Birch trees, and less frequently with Firs and Larches. The mushroom’s association with the tree is a symbiotic one. Specifically, it is a mycorrhiza (literally fungus-root) relation where the A. muscaria is enhancing mineral uptake for the tree and in return it is receiving carbohydrates from the root of the tree. The relationship is also an obligate one such that if the host trees are absent, the A. muscaria will also not be present. The Aryans were a warrior and grain-growing people. They had a tribal religion with a hereditary priesthood, with a full compliment of gods, including Soma. Their homeland was somewhere in Central Asia. Approximately 4000 years ago, they split into three distinct groups. Two of these were the Indic and Iranian. The Indics settled into what is now Afghanistan and the Valley of the Indus. The other group settled in what is now Iran and became the Iranian People. Both groups, orally, passed on their religious knowledge, which was later written down and has been preserved to the present. Specifically, these religious works are the Rig Veda and the Avesta, of the Indian Hindus and Iranian Zorasters, respectively. In both religions there is reference to a plant, which is believed to have hallucinogenic properties and was used in religious ceremonies. The Plant was referred to as Soma in the Rig Veda and Haoma in the Avesta. The descendants of these people would continue to carry out the ceremonies involving their sacred plant, but the knowledge as to the actual identity of Soma/Haoma would eventually be lost and a substitute, non-psychoactive one adopted in order to carry out the ceremony. It has been assumed that the adoption of a new sacred plant occurred because the original was no longer available, after leaving their original homeland. Although western scholars generally agreed that Soma and Haoma are the same plant, there is strong disagreement as to the actual identity of this plant. Numerous plants have been proposed, during the last two centuries, as the true Soma/Haoma. These included, Ephedra, rhubarb, opium, chicory and hashish. For reasons too many to cover here, all of the above plants, and more, have been rejected as being Soma/Haoma. Before Wasson put forward the concept that the sacred plant was A. muscaria, the common assumption of scholars who attempted to determine its identity was that it was indeed a “plant”. In Wasson’s search for the identity of the sacred plant, he concentrated most of his evidence on recent translations of the Rig Veda and made only occasional mention of the Avesta. Thus, the reason for the title of Gordon Wasson’s 1968 opus: Soma Divine Mushroom of Immortality. It was here that Wasson would put forward, what would be at that time, a unique suggestion that Soma was a mushroom rather than a plant. Some of the clues that led Wasson to believe that Soma was a mushroom rather than a plant was that the Rig Veda described Soma as a small, leafless plant with a fleshy stalk. No reference was ever made about roots, flowers and seeds. Nor was there a description on propagating this plant. If Soma was indeed a plant, why would the Aryans not have bought it with them, when they migrated and began cultivation once they had settled? The Aryans were, after all, known for their prowess as farmers and would have been able to grow Soma had it been a plant. The Rig Veda also specifically states that Soma can only be found growing in the mountains, which is where A. muscaria can only be found in the latitude of the Indus Valley. However, these mountains were not accessible to the Aryans. Although they had conquered the valley, the mountains would continue to be held by their enemies, probably the Dasyus. Thus, necessitating the need for a Soma substitute. Finally, a clue that was crucial in the determination of the identity of Soma was one of its the unique properties. That Soma could be consumed in two forms: 1 Consumed directly, by either eating the raw mushroom or drinking its juices or 2. Taken in the urine of the person who has ingested A. muscaria. Consumption of the latter was first rediscovered by a Swedish army officer, Filip Johann von Strahlenberg, while a captive of the Russians in Siberia. His observation of this event was published in 1730. This is the only “plant” that is capable of being passed through the digestive system and maintains its psychotropic properties. Wasson also believed that there is an apparent function in the urine drinking ceremony. In modern experience the A. muscaria causes nausea, when consumed, probably due to other toxins, which occur in this species. It is possible that passing Soma through the digestive tract eliminates the nausea causing metabolite. Usage of A. muscaria, in Siberia continued until the 16th and 17th Century, but was discontinued in favor of alcohol, which was introduced by the Russians. There are a number of plants and mushrooms, other than Soma, that have been utilized in religious ceremonies. What sets Soma apart was that it was also considered a god. This is the only plant known to have been deified by man. Although not a main god, Soma was a tangible, visible entity, with a singular role. When ingested during the course of the religious ritual, a god comes down and manifesting himself to the Aryans. Only the priest apparently consumed Soma. The dried Soma was freshened with water and macerated with a stone pestle that brought forth a tawny yellow juice. Wasson described effects of Soma as “having astonishing psychic effects, comparable to those of the Mexican hallucinogenic mushrooms, comparable but different”. Although Wasson interpreted the affects of Soma as producing a feeling of ecstasy, In the several times that he had consumed A. muscaria, the results were rather disappointing and were certainly not comparable to his experience with the Psilocybe mushroom that he consumed, in 1955, while in Mexico. He had tried eating the mushrooms raw, drank the juice and mixed it with milk, always on an empty stomach. However, on one occasion, in Japan, while with several other mycologists, Rokuya Imazeki toasted the cap of a mushroom on a fork over an open fire. After awaking from his sleep, he described his experience as "beyond all comparison" and that "this was nothing like the alcoholic state; it was infinitely better". Wasson never tried cooking A. muscaria and later believed that this was possibly the reason that he had not experience the results that he had expected. 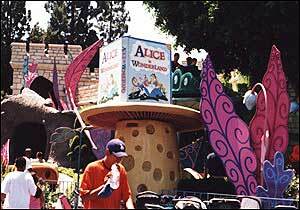 Nevertheless, there is a great deal of inconsistencies in the experiences of the people in the United States who have tried A. muscaria to achieve a "religious experience". In the past, those who sampled A. muscaria usually became ill, experiencing nausea and vomiting. Few experienced the ecstasy described by Wasson. However, the theory put forth by Wasson concerning the cooking/drying of the mushroom before consumption apparently was taken to heart by many. There are now many reports of "ecstasy" when A. muscaria is dried or cook, prior to consumption. Although Wasson has presented good evidence that A. muscaria is the Soma described in the Rig Veda, other candidates for Soma have been put forth. In 1989, David Flattery and Martin Schartz put forth Peganum harmala (Harmel or Wild Rue) as the true Soma in their book: The Botanical Identity of the Indo-Iranian Sacred Hallucinogen "Soma" and Its Legacy in Religion, Language and Middle Eastern Folklore. Unlike Wasson, Flattery and Schartz concentrated on the Iranian Avesta rather than the Indian Rig Veda to determine the identity of Soma/Haoma. Peganum harmala is a weed that occurs locally and is well known for its hallucinogenic effects and usage, even today. While their research on the identity of Haoma was very scholarly, well received and took ethnobotanical research to a higher level, there were critics that questioned that P. harmala is the Haoma described in the Avesta. The main criticism of their theory was based on the well known affects of this plant since it is still presently utilized for "recreational" purposes. The experiences described by their users apparently do not live up to the expectations of ecstatic feelings described in either the Rig Veda or Avesta. A further theory was advanced recently that was based on new archeological finds in Russian excavations in the Kara Kum desert of Turkmenistan. A number of sites were uncovered, dating to 2000 B.C. Among them, Gonur South, which is bordered by Iran to the south, Kazakhstan to the north and the Caspian Sea to the west, included a large shrine that was divided into two parts: one was used for public worship and other was hidden from public view and used by the priesthood. In one of the rooms of the latter were ceramic bowls containing plant material. Analysis of the remnants were determined to be a mixture of Ephedra and Cannabis and was apparently used in concocting a hallucinogenic drink. In an adjoining room was found utensils designed to separate the juices from the plant material for the making of the hallucinogenic beverages. At a later site, another shrine, at Togoluk, was found to have similar utensils and again Ephedra was identified, but this time in association with the pollen of poppies. In both sites, the hallucinogenic drinks were believed to be for the worshippers. The artifacts that were discovered allow archeologists to reach certain conclusion concerning these sites in this eastern Iranian cultural regions. One of these conclusions, and the one that is germane to our discussion is that between 2000 and 1000 B.C., that the Haoma, the Iranian Soma, was a composite psychoactive drink composed of Ephedra and Cannabis in one site and Ephedra and opium in another. Among those that believed that A. muscaria was not Soma also included Wendy Doniger O'Flaherty, the Sanskritist that participated in much of the translation of the Rig Veda for Wasson. She and Brian Smith offered what was another unique suggestion concerning Soma. Their work suggests that Soma never really existed, except in the minds of the priest, and that the plants used during the religious ceremonies have always been substitutes for this mythical Soma. Wasson believed that the sacred plant of the Rig Veda and Avesta to be A. muscaria. However, he also believed that the impact of Soma/Haoma was not restricted to these two religions and was more wide spread. The Ling Chih is an herb that has been known in China for two thousands years. It is a symbol of good fortune, good health, and longevity, even life with the immortals. It has always been regarded as indigenous to China. However, Wasson suggest that the idea came from India via “idea diffusion”. Another words, the Chinese would “hear” of certain practices in India and would attempt to duplicate them. Before the discovery of the Ling Chih, “chih” was already used to refer to “mushroom” and had a long history in China by the time of the Chin Dynasty (B.C. 221-207) under the Emperor Shih-Huang, known as the “First Emperor” because it was he who unified all China for the first time and was the one who built the Chinese Wall. However, it was not until his reign that the concept of a supernatural mushroom with miraculous powers came about. Suddenly, there was talk about a wonder fungus, and people began searching for it, especially in the mountains, but were unable to find it. Prior to his reign no mention of such a fungus had been recorded. The emperor in his effort to find the mushroom ordered his magicians to find this mushroom. While they may have believed in this supernatural mushroom, and its supernatural properties, they were ignorant of its whereabouts and appearance. Finally, a sailing vessel was sent by the First Emperor to the Eastern Sea to find the mysterious fungus on islands off the coast and far away. Although there were many accounts of the voyage, the mushroom was not brought back. Wasson believed that the report of this fungus sought by Shih-Hung was Soma and that it had reached the Emperor by sea route from India. Thus, the ideas of sending sailing vessels to the source of the information and the search for the mushroom in the mountains. It would be another century, after the time of the First Emperor, in B.C. 109, before an actual fungus would be identified as the Ling Chih. This would take place during the Han Dynasty (B.C. 206 - A.D. 220), during the reign of Wu-ti. Under the Emperor Wu taxes were high and he was not popular. During the late summer, in an inner pavilion of the palace, a fungus was found that was described as a marvelous growth with nine paired “leaves”. The Emperor Wu designated this fungus as the chih that was sought by Shi-huang and his magicians, but never found. He utilized the new found fungus as a public relation ploy to turn the people in his favor. With the discovery of the Ling Chih, he proclaimed amnesty of preservers, served beef and wine to a hundred families and composed an ode for the occasion, the earliest poem about a mushroom. Unlike Soma, the identity of Ling Chih is known; it is Ganoderma lucidum, which has now been represented in Oriental art - Chinese, Japanese, and Korean for centuries. Although this fungus has nothing to do with Soma, if not for Soma, Ling Chih would not exist today. In 1970, John Allegro authored the controversial book, The Mushroom and the Cross. The main theme of the book alleges that Judaism and Christianity were based on a secret cult whose god was Amanita muscaria, but was represented in the person of Jesus, the Christ. He believed that the cult was very cryptic in its writings and made interpretations that are often difficult to follow and more difficult to verify since the interpretations were derived from ancient writings that few could read. The cult eventually died out, but Christianity and Judaism remained as religions. "...the plant in this fresco has nothing whatever to do with mushrooms...and the similarity with Amanita muscaria is purely fortuitious. The Plaincourault fresco is only one example -- and, since the style is provincial, a particularly deceptive one -- of a conventionalized tree type, prevalent in Romanesque and early Gothic art, which art historians actually refer to as a "mushroom tree" or in German, Pilzbaum. It comes about by the gradual schematization of the impressionistically rendered Italian pine tree in Roman and Early Christian painting, and there are hundreds of instances exemplifying this development -- unknown of course to mycologists...What the mycologists have overlooked is that the mediaeval artists hardly ever worked from nature but from classical prototypes which in the course of repeated copying became quite unrecognizable." Wasson agreed with the interpretation and used this explanation in his Soma book to dismiss the notion that A. muscaria was the tree of life, as most art historians have done. Allegro, John: Author of The Mushroom and the Cross. The author presented evidence that Judaism and Christianity were based on a secret cult whose god was Amanita muscaria, but was represented in the person of Jesus, the Christ. Amanita muscaria: Scientific name for the Fly Agaric, also thought by some to be the Soma and the Haoma. Aryans: The people whose origin was thought to be from Central Asia. After leaving their homeland, they split into several groups, approximately 4000 years ago. One group settled in the Valley of the Indus, which is now Afghanistan, and another settled in what is now Iran and became the Iranian Zorasters. Avesta: The holy book of the Iranian Zorasters. Death cup: Common name for the cup-shaped, remnant of the universal veil at the base of the stalk. Fly Agaric: Common name for the species of mushroom referred to as the Amanita muscaria. 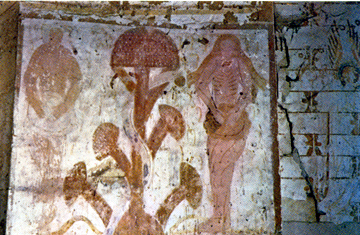 Fresco at Abbaye de Plaincourault Mérigny, France: Fresco used as evidence that A. muscaria was the “tree of knowledge” where Adam and Eve at the forbidden “apple”. Haoma: Name given to the mushroom god described in the Avesta, which was used in religious ceremonies and has hallucinogenic properties. It is thought by Wasson and others to be the mushroom Amanita muscaria. Iranian Zorasters: People who originally settled in what is now Iran and trace their ancestry back to the Aryans from Central Asia. Ling Chih: Common name for Ganoderma lucidum, a species of polypore that has been used as an herbal medicine, in China, for about 2000 years. The concept of this “miraculous mushroom” owes it origin, according to Wasson, to Soma. Wasson believed that news of Soma reached China, through shipping routes. Unable to find the miraculous mushroom, the Emperor Wu-Ti designated the Ganoderma lucidum to be the miraculous mushroom. Mycorrhiza: The symbiotic relationship between the roots of plants and a fungus. In the case of A. muscaria, it is an obligate one. If the host trees are not present, usually pines and birch species, the mushrooms will also be absent. Rig Veda: The holy book of the Hindu. Soma: Name given to the mushroom god described in the Rig Veda, which was used in religious ceremonies and has hallucinogenic properties. It is thought by Wasson and others to be the mushroom Amanita muscaria. Universal veil: The white layer surrounding the entire mature mushroom of A. muscaria, which resembles an egg at this stage. When the mushroom matures, the universal veil breaks apart, with remnants left on the cap as speckled “warts” and as a cup-shaped structure at the base of the stalk called the volva or death cup. Volva: The scientific name for the cup-shaped, remnant of the universal veil at the base of the stalk. Wasson, R. Gordon: Author of Soma, Divine Mushroom of Immortality where he puts forth the concept that Amanita muscaria was the Soma described in the Rig Veda and was a hallucinogen used for religious ceremonies until the identity of Soma was lost. Even though neither the scientific name, Amanita muscaria, nor the common name "Fly Agaric", is familiar to most people outside the study of mycology, it is likely that most people are familiar with this mushroom or at least have seen pictures of this mushroom. Why is that? What evidence does Wasson use to indicate that the A. muscaria was the Soma that was described in the Rig Veda? What were some other plants that had been proposed as Soma prior to Wasson's proposal that A. muscaria was Soma. Since Wasson's proposal, a new plant has been identified as another serious candidate for Soma/Haoma. Who made this proposal and what evidence did they use to determine the identity of Soma/Haoma? Although China did not have a history of Soma/Haoma, Wasson believed that the origin of one of China's ancient herbs, the Ling Chih resulted from Soma/Haoma. How did Wasson believe this to come about? Who is John Allegro and what was the controversial theory that he proposed? What is the often cited evidence that is used by his followers to validate Allegro's theory? Even before Allegro proposed his theory, Wasson had dismissed the notion that A. muscaria had anything to do with Adam and Eve. What was the evidence that was used?